What Lies Beyond is an article written by Arthur Conan Doyle first published in The Church Times No. 3139 on 23 march 1923. Sir, — In your very courteous account of my exhibition of psychic slides to members of the Press you say, "Not one jot has been added to our knowledge of the grave and all that lies beyond it." If the writer had said that he does not believe what has been added, then he is, of course, well within his rights. But I raise my eyes to the shelf above me and I see standing there Vale Owen's "Beyond the Veil" (four volumes), "Raymond," by Sir Oliver Lodge, "Letters from the Other Side," "The Blue Island," Crowell's "Spirit World," Rev. 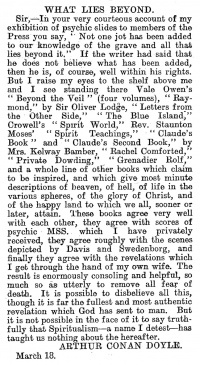 Staunton Moses' "Spirit Teachings," "Claude's Book" and "Claude's Second Book," by Mrs. Kelway Bamber, "Rachel Comforted," "Private Dowding," "Grenadier Rolf," and a whole line of other books which claim to be inspired, and which give most minute descriptions of heaven, of hell, of life in the various spheres, of the glory of Christ, and of the happy land to which we all, sooner or later, attain. These books agree very well with each other, they agree with scores of psychic MSS, which I have privately received, they agree roughly with the scenes depicted by Davis and Swedenborg, and finally they agree with the revelations which I get through the hand of my own wife. The result is enormously consoling and helpful, so much so as utterly to remove all fear of death. It is possible to disbelieve all this, though it is far the fullest and most authentic revelation which God has sent to man. But it is not possible in the face of it to say truthfully that Spiritualism — a name I detest — has taught us nothing about the hereafter. This page was last edited on 19 July 2016, at 15:45.